These roasted Brussels sprouts aren't just gorgeous, but delicious with roasted chicken or ham, or as a vegetarian main with some grilled polenta. Pink and green is such a fantastic color combo. It reminds me of pretty, preppy blonde girls decked out in Lilly Pulitzer, yes. But it also reminds me of spring. The spring that visited Southern California last week. The spring when it was 80 degrees and sunny. The spring where I planted a new lime tree (named Margarita, natch). The spring before our evening weather dipped perilously close to freezing. The spring we had last week was one in a series of false springs that usually start in January around these parts. It’s enough to trick the daffodils to bloom, and me into thinking I can host a dinner party out-of-doors. I was so fooled, in fact, that I actually put a spray tan on my pasty legs in anticipation of the many days of shorts weather to come. But, I was wrong. So wrong. For winter is back and I’m covered head to toe with cashmere, fleece and lambskin boots (and sitting conveniently at my perch at the kitchen table under the heater vent). It’s okay, really, because I know in just a few short months it will be hot. HOT! And that is the weather I hate most of all. Spring is a lot like life, isn’t it? It’s always two steps forward, and one step back. But I know she’s coming soon, because my weekly produce box tells me so (It’s a heckova lot more reliable than that groundhog). In my box there are Brussels sprouts, peas, and broccoli. There are baby greens and carrots. And the strawberries are particularly gorgeous and juicy this year. So while it’s still cold outside, I’ll make good use of my time spent inside–cooking up simple lunches for Matt and me. The kids hate brussels sprouts, and particularly the way it makes the house smell. So we have them often when the kids are out of the house at school. 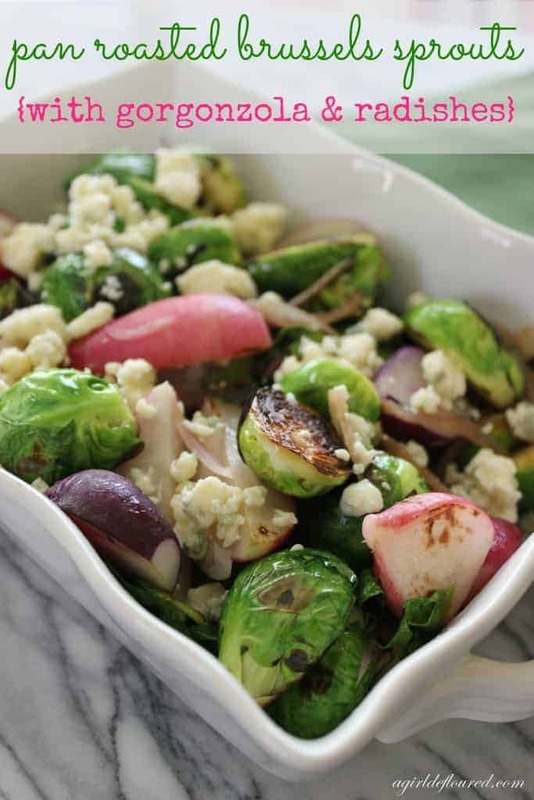 This roasted Brussels sprouts recipe came about quite serendipitously–the garden is still overflowing with radishes (a new addiction for me), and we had quite a lot of Brussels sprouts to use up. They looked so beautiful sitting together on the counter that I thought, what the hell, and I threw them in a hot pan to see what would happen. What happened was magic. Earthy, crunchy, zippy magic. It was such a fantastic combination, in fact, that I may never want to eat brussels sprouts another way again. 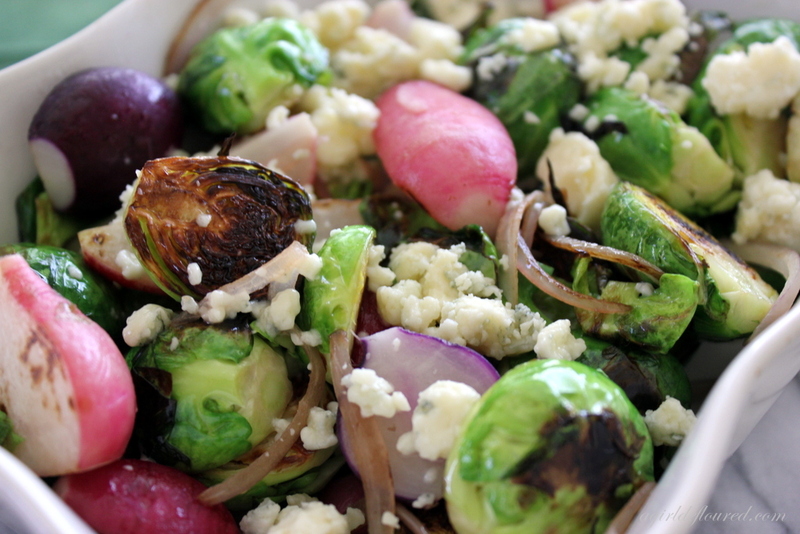 These colorful roasted Brussels sprouts are not only gorgeous, but about the best thing I’ve ever eaten. Serve them with with roasted chicken or ham, or as a vegetarian main with some grilled polenta. Halve brussels sprouts and cut off any woody stems. Set aside. Scrub radishes, and trim root and stem ends. Halve radishes, as well. Heat olive oil in a large skillet over medium high heat. 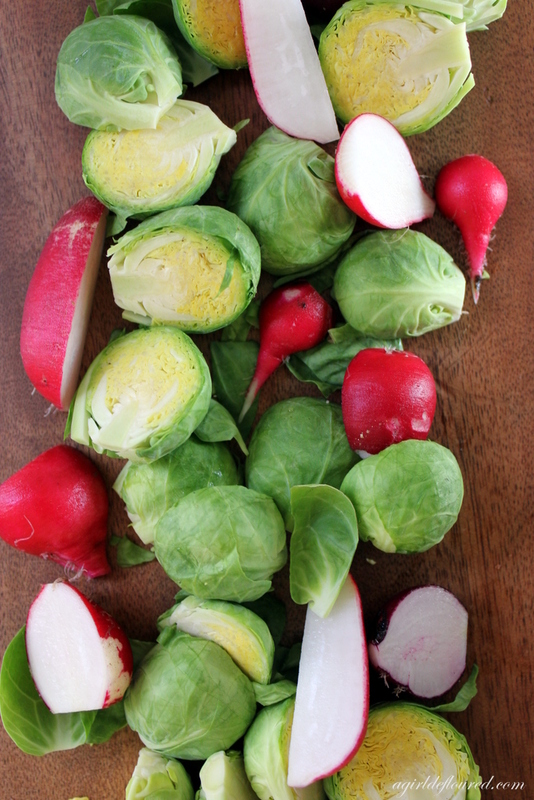 Add brussels sprouts and radishes and cook, stirring occasionally for 3 minutes. 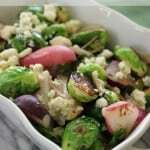 Stir in shallots and cook for 2 minutes more, or until brussels sprouts begin to brown and the vegetables are tender. Season to taste with salt and pepper and place in a serving bowl. Top with the crumbled gorgonzola. Serve immediately. This entry was posted in Recipes, Recipes & Techniques by Cooks We Love, Side Dishes and tagged A Girl Defloured, Alison Needham, autism gluten free, autoimmune disease, celiac, celiac disease, celiac health, food allergies, g-free, g-free diet, gluten allergy, gluten free, gluten free baking, gluten free cooking, gluten free diet, gluten free dining, gluten free food, gluten free health. Bookmark the permalink.